Expomin brings together 1,700 mine suppliers from 36 countries around the world, compiling the best and most diverse range of technology, equipment, machines, services and suppliers for the Chilean and Latin American mining industry. Therefore it was only fitting that Cypher Environmental took part this year, to help raise awareness in the Chilean mining industry about the unique cost saving mining solutions that Cypher has developed. This year, Expomin took place from April 25th – 29th, in Santiago, Chile, and offered a great platform to demonstrate our unique road solutions. As we have done in the past, Cypher took advantage of the program offered by CAMESE (Canadian Association of Mining Equipment and Services for Export), and had a spot to showcase our road stabilization and dust control solutions at the Canada pavilion. CAMESE always does a great job of organizing the pavilion, to showcase the best and most innovative Canadian mining solutions, and this year was no exception. 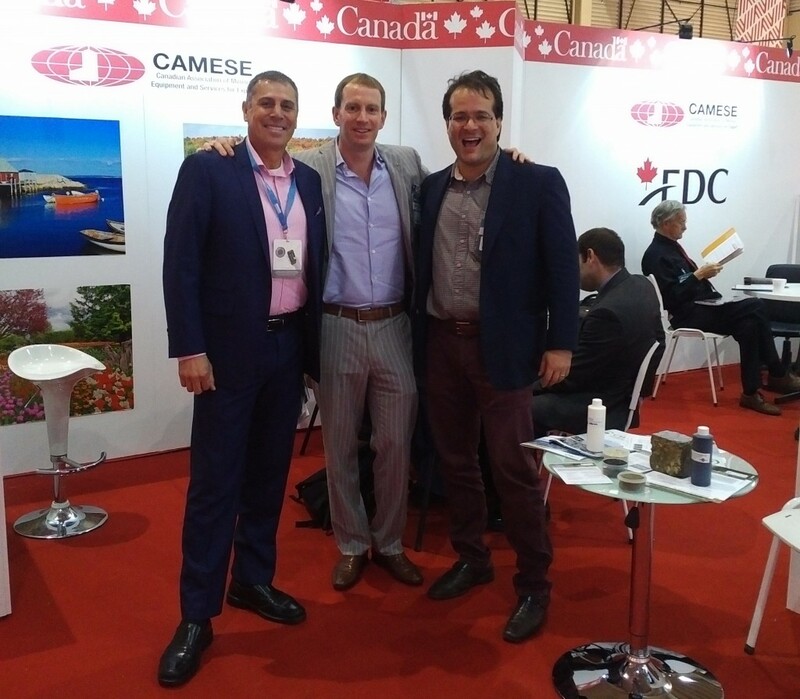 As usual, EDC (Export Development Canada) partnered with CAMESE for another great matchmaking session, helping to arrange targeted meetings with Canadian mining suppliers and the Chilean mining companies that were present. In 2014, Chile produced 31% of the world’s copper supply, amongst other commodities, making the country a huge potential market for Canadian companies, and proving why the EDC matchmaking is so valuable to suppliers like Cypher. In certain parts of Chile, such as the Northern region, water resources are scarce. Therefore Dust Stop was a popular topic during our meetings with the major Chilean mines, looking to reduce their water consumption used for their haul road dust control programs. Another hot topic in mining all over the world these days is reducing energy consumption, which EarthZyme has proven very useful for to improve efficiency of haul trucks running on the stabilized road surface by reducing rolling resistance. Therefore, above and beyond the positive environmental impact our solutions offer, the cost saving properties are really getting noticed and keep us busy at these international mining events! A big thank you again to CAMESE and EDC for putting together a great program in Santiago last week, and for more information on the cost saving benefits of our road dust control and soil stabilization solutions, please contact us.